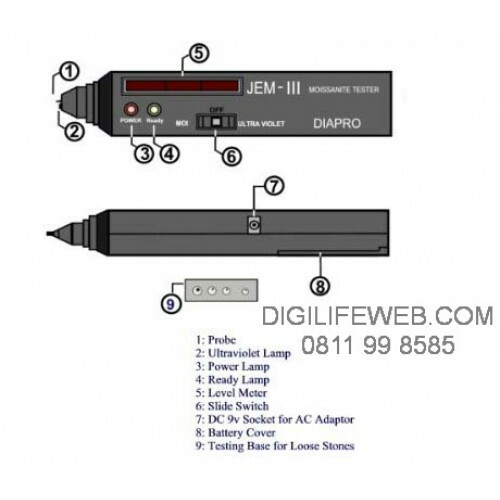 This JEM II Diamond Tester can effectively and quickly distinguish the diamonds from the other kind of stones like Cubic Zirconia, YAG, GGG (other kind of stones). It has a ultraviolet lamp for checking fluorescent reaction of stones. This Moissanite tester used to form a complete set with Diamond Selector. This tester which is rare in the world at present is special instrument that can distinguish synthetic moissanite from natural diamonds. It will give you more convenience and the sense of security in shopping your valuable diamond jewellery. What’s the different Moissanite / Diamond tester and Diamond Selector? Moissanite is a kind of man-made stone which has very similar properties to that of diamond which Diamond Selector cannot distinguish it. So jewellery shops often use these two testers in a combination, that is, they use diamond selecter to distinguish diamonds and moissanite from other fake stones like cubic (cz). After positive testing result for diamonds, then use Moissanite/ Diamond tester to distinguish the real diamonds ( natural ) from moissanite stones. 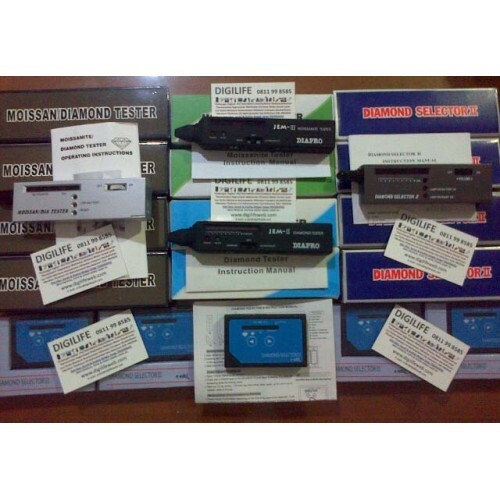 - Pocket size, portable and user friendly. - Low electronicity consumption, warning and indicating functions if the battery just has low electricity. To distinguish diamonds and moissanite from other fake stones like cubic zirconia, moonstone or any other stones. 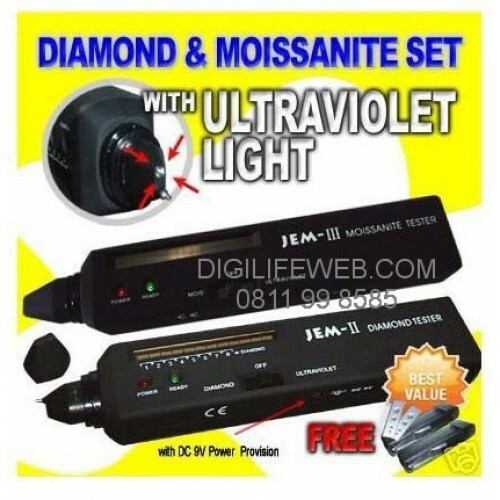 After positive testing result for diamonds with JEM II, then use JEM III tester to distinguish the real diamonds ( natural ) from moissanite stones. Moissanite is a kind of manmade stone which has very similar properties to that of diamond which Diamond Selector cannot distinguish it. This Moissanite tester used to form a complete set with Diamond Selector . It will give you more convenience and the sense of security in shopping your valuable diamond jewellery. This Moissanite tester can't be used to test Diamond or Cubic stone. 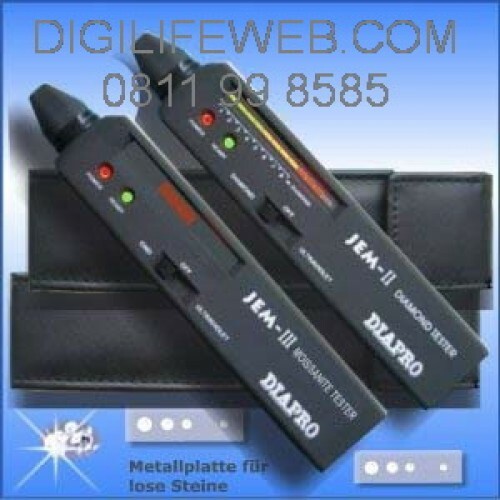 To test Diamond or Cubic, correct tester is Diamond Selector II (or) DIAPRO JEM II first if u want to distinguish diamond and cubic stone. After you got positive result of Diamonds, then use Moissanite tester to distinguish natural diamond or moissanite diamond. Technology of Moissanite tester is that tester distinguish only it is positive of moissanite, If it is positive, then moissanite light is come up. If it is not positive (negative), it shows as as Diamond. So if Moissanite tester is used to test cubic stone, tester can't find moissanite from the stone, so it will give wrong test result cubic as diamond. Question: Why JEM II making beep sound without stop ? Answer : There is volume adjustment in the side of JEM II which you have to adjust according to the size of the stone what you are testing. 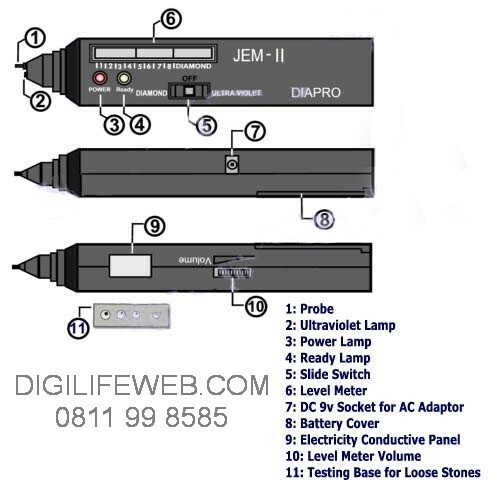 By adjusting this level on JEM II, the light panel on the top of the tester will move between the level of 1 to 8 bar. If you hear sound without stop, this might be because the light bar is over the level of 7/8 bar. You have to adjust the volumn to get the light bar to level 2/3 . Then test the stone while touching your finger on the metal plate on the side of the tester. If the stone is diamond, then light bar will move from the level 2/3 to 6/7/8 and will beep the sound. If your stone is cz or glass, the light bar will not move. For mounted jewelry, please hold the jewelry with one hand while the other hand is holding the diamond selector keeping at least one finger touching the Electricity Conductive Panel of the diamond selector then gently apply the testing probe to the stone to be tested perpendicularly. For loose stone, stone should be placed on loose stone testing platform. Hold the testing platform on one hand while the other hand is holding the diamond selector keeping at least one finger touching the Electricity Conductive Panel of the diamond selector then gently apply the testing probe to the stone to be tested perpendicularly. If LED lights up to red zone with three periodic beep sound, then the stone that is being tested is a diamond. If a simulant, all LED bars do't light up or it lights up to the green or yellow zone only (it varies from different models of simulant). And a continuous beeping sound will be heard if the probe touches the metal part of the object to be tested such as rings and earrings. Recommended testing environment temperature is from 18°C to 30°C. Stone temperature should be the same as environment temperature. Environment temperature exceeding to 35°C will cause incorrect testing results. Replace battery immediately as soon as red light dims. When testing small stones (like 10pt below), it is recommended to take off the diamond from body and let them cool down to room temperature (from 18°C to 30°C) before conducting a test. Small stones attached to human body have higher temperature which causes incorrect results when put on test. To test the fluorescent reaction of stones under ultraviolet light, move the Slide Switch to Ultraviolet to light up the ultraviolet LED. AC adaptor (110V-240V, DC 9V) is recommended (not included) for long time indoor operation. Always set the Slide Switch to OFF position after every use. It doesn't need to be calibrated when testing stones with sizes over 5pt. Adjust the Level Meter Volume to add lighted columns in LED level meter bars to meet special needs when testing stones with sizes less than 5pt.